← Israel attack on Syria Justified?? n this day, in the records of military warfare, a tale of bravery was written – when an army of 21 Sikh soldiers, in an isolated communications post, made a gallant stand against an enemy 10,000 strong. Fighting to the last man, they would create a lasting legacy of human bravery and valour on the battlefield. 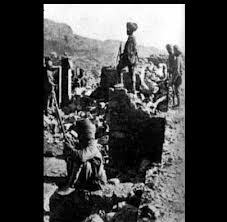 12th September 1897 was the day when the Battle of Saragarhi was fought. The Commanding Officer of 36th Sikh, Lt. Col. Haughton, was at Fort Lockhart and in communication with the Saragarhi post. He could see from his position that the tribes were numbered around ten to twelve thousand and requested for reinforcements from Headquarters. Havildar Singh and his men knew well that Saragarhi would fall, because a handful of men in that make-shift post of stones and mud walls with a wooden door could not withstand the onslaught of thousands of tribesmen. The soldiers’ duty was to defend Saragarhi while waiting for reinforcements to arrive. The Battle of Saragarhi is a tale of the incredible valour of a handful of soldiers who believed in their duty and remained unconquered even in death, with the Sikh war cry ringing from their dying lips in defiance of the foe. You must not and will not be forgotten. Posted on February 2, 2013, in Uncategorized and tagged politics. Bookmark the permalink. 1 Comment. Awesome. This episode is known as one of only six incidences of valour in entire military history.